Forward of the saloon is a double/twin cabin, a heads with shower, washbasin and WC and a wet/hanging locker. Aft of the saloon is the well equipped galley with double hob, oven and grill accompanied by the refrigerated ice box. On the port side is the navigation station. 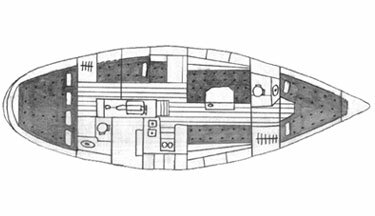 To the rear of the chart table is a pilot berth, and aft of this a short passage leads to the large aft double/twin cabin with en suite heads. All of the cabins have central heating outlets. 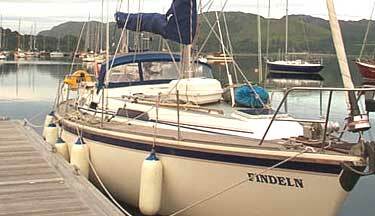 Findeln is a centre cockpit cruising boat capable of leisurely cruises or serious offshore passage making, with very comfortable accommodation for eight in a large aft double cabin, double and single in the saloon, forward twin/double and pilot berth.Two heads, both with pressurised hot and cold water and showers, large spacious saloon and well equipped galley and navigation station with full instrumentation (GPS, VHF, wind, speed and depth etc). These are accompanied by diesel heating, furling genoa (new 2002), stacpac mainsail with all lines led to cockpit (new 2003) and oversized winches, electric anchor windlass, teak decks, shorepower, tender and 4hp outboard, and a 29hp Volvo engine.